I have the next three days off... so Tim and I are leaving town (again). We figure we might as well do it now when we have the chance. 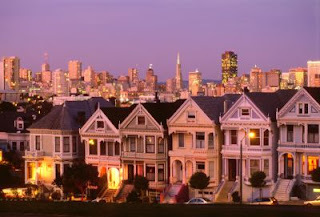 We are going to celebrate his brother Joe's Birthday tomorrow and then just spend some time with some of my friends in the beautiful city of San Francisco. We are so fortunate that his mom has a beautiful apartment there and we can use it anytime we would like. So today, we leave for Walnut Creek (thats where all of his family lives, so its becoming our second home) and then tomorrow night after we celebrate Joe's bday, we are leaving for the city. While in the city, I hope to get some quality shopping in. I also hope to catch up on some much needed sleep because Saturday through Wednesday I will be working and have to wake up around 3AM each morning! Crazyness, but I am so fortunate to have a job in the field I went to college for. Let me know if you are in the area and want to hang out! Me! i want to hang out! have fun in walnut creek! bring warm clothes because it's cold herrrrre! i best be seeing you missy!